Alas, Sleepy Hollow, Headless Horseman, what have they done to you this time? Just when I have begun to fall in love with those two elements and decide to give a chance to a graphic novel aimed for children with a twist, it turns out to be an almost total disaster. 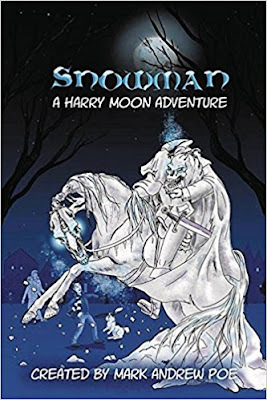 Created by Mark Andrew Poe,‎ adapted by Joyce Magnin and with art by‎ Rebecca P. Minor, Snowman is hard to like or even tolerate. I have no problems with the story, to be honest. It is simple, direct, easy to follow for kids and catches the attention on the reader. It’s an interesting twist to the Headless Horseman that I really enjoyed. In fact, with a little polishing, it could be the kind of content we need to show kids nowadays, even more if we want darker, gothic plots in family friendly TV shows and movies. The characters were very basic, not that lain as I could see they had some human parts in them, but a little empty nonetheless, and the situations were interesting to see while developing. Maybe some adults could enjoy it as well, maybe those who are parents, as I see some curious scenes that could lead to different discussions and teachings for children. However, my main issue with 'Snowman' is with its graphics, a vital part of comics and graphic novels. The cover is nice, I love it, it caught my attention right away, but the pages I found inside were a totally different thing that I didn’t like at all, starting with the palettes; the very first pages used one and the rest of them used another one. I’ve read a lot of comic, some with good proportions, others with twisted characters that have nothing to do with human form, but most of them looked pretty good in their respective stories, in their respective universes. That’s not the case for 'Snowman', whose characters I felt were cut from another place and pasted in the panels, whose bodies had something weird in them. I wouldn’t have any problem if this was an independent project from someone who had just started building a name as an illustrator, but coming from what seems to be a solid series with what I assumed was a solid fan-base, that’s not what I expected; yet, we all know that independents have done and keep doing great work. It’s a shame that a story with potential has this kind of art, I really expected way much more. I may be picky and know nothing about the standards the industry works with, but there must be something wrong if such art was ever approved. Prepare all your will to finish this book if you start reading it. I can only hope that it doesn’t happen again.